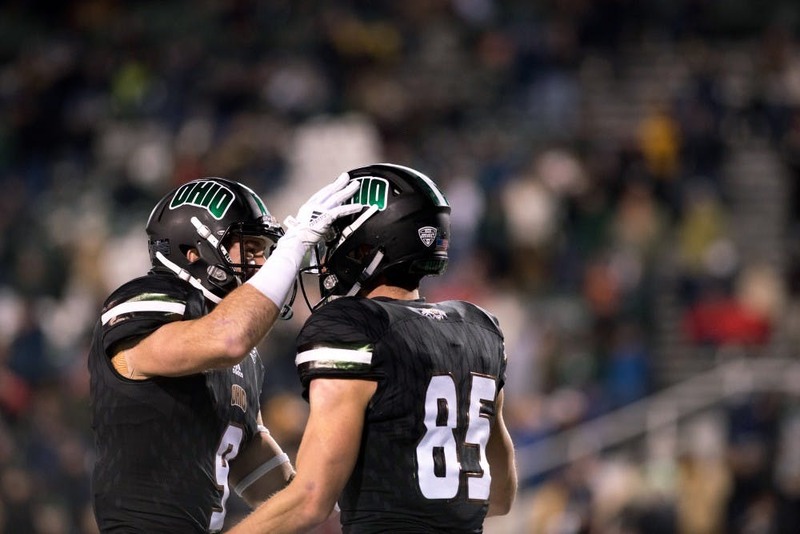 With only two games left in the regular season, Ohio is poised to win the Mid-American Conference East Division for the second straight season. Ohio only needs to beat Akron on the road Tuesday to clinch the division and earn a spot in the MAC Championship Game on Dec. 2. As Ohio comes off a 38-10 win over MAC West foe Toledo, it has sealed a spot as one of the conference’s premier teams. Here are five things to know about the Bobcats before they play the Zips on Tuesday. The Bobcats overtook the Rockets as the best team in the MAC after the win last Wednesday. Not only did the Bobcats win, they controlled the game. They held the Rockets to a season-low for points. It was the defense’s best performance of the season. The Bobcats sacked Rockets quarterback Logan Woodside four times, which caused him to not fall into a rhythm for the game. The defense is peaking at the right time, and that’s only going to help the Bobcats as the end of the regular season nears. The next game has always been the biggest game for the Bobcats. Though winning every game is obviously ideal , the Bobcats know they need to beat the Zips. If the Bobcats lose, they would be tied for first with the Zips, who would own the tiebreaker, in the MAC East. With a loss Tuesday, Ohio would need a win against Buffalo and a loss from Akron against Kent State next week in the regular season’s final games. The Bobcats know beating the Zips won’t be easy. Last season, the Bobcats won by six points at home against the Zips. The season before that, the Bobcats won by just two points on the road. Ohio has the best offense in the MAC and has scored 40 or more points six times this season, but Akron has the fourth-ranked scoring defense in the MAC. The Bobcats’ offense will need another quality performance to help clinch the MAC East. This week marks the Bobcats’ shortest week heading into a game. After playing Kent State, the Bobcats had 10 days before playing Miami. After playing Miami, Ohio had eight days until Toledo. But heading into Akron, Ohio will have only had six days off, and only four days of practice. Coach Frank Solich said the Bobcats have been fairly healthy, emphasizing the importance of the 10-day break before Miami. After Akron, the Bobcats will have a 10-day break before playing Buffalo. Last season, Ohio had a similar best-win-of-the-season type game against Toledo. The Toledo game last season marked Ohio’s ninth game of the season, and the win propelled the Bobcats through the rest of the season. This season, the Toledo game was Ohio’s tenth game. The win has the potential to give the Bobcats momentum heading into the postseason. With only two games left, the Bobcats are the best team in the MAC. They want to keep it that way.